TABASCO® brand Sriracha Sauce --- 4 Tbsp. Bacon slices --- 8 ea. Sesame seed buns --- 4 ea. Preheat a griddle to medium-high; preheat an oven to 350ºF. On griddle, cook bacon until crispy; set aside. Make four 8-oz. patties from ground turkey; cook on griddle until temperature reaches 165ºF. Add Sriracha–blue cheese mixture to top of each patty, and lightly melt. Slice cherry tomatoes in half, roast in oven 2–3 minutes. Place 2 lettuce leaves on bottom of each bun; place a burger over each. 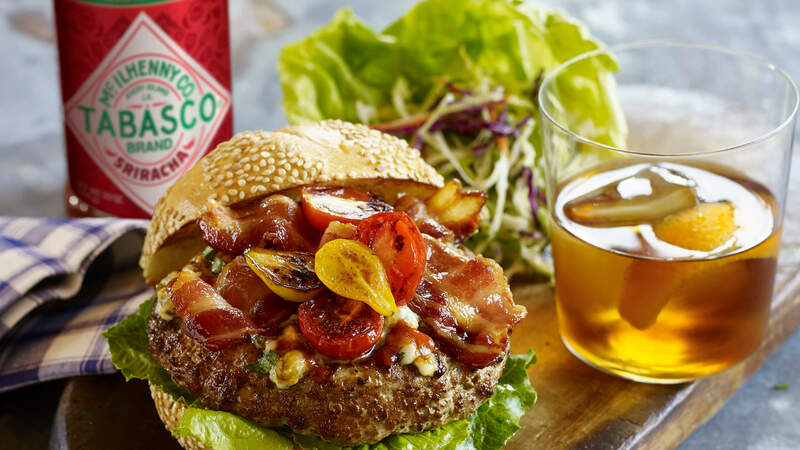 Place cherry tomatoes atop burgers and layer each with 2 bacon slices. Close burgers with top buns and serve.